Adobe Flash Player 21 has been released and is available for download and testing. The latest release has been codenamed as Sutter. The new Flash Player 21 includes enhancements and bug fixes related to performance, security, stability and device compatibility. The fixes are for both Flash Player 21 and Adobe Air 21. Normally if you have Flash Player installed on your computer and have automatic updates enabled, the new version will be installed automatically when the final version of Flash Player 21 is released. But if you want to go a step ahead, then you can download and install the latest beta versions of the Flash Player installer. Before we discuss the latest enhancements and security fixes in Flash Player 20, let’s go through thedirect download links to its offline installers. Please note that ActiveX component of Flash Player 21 is not compatible with Windows 8, Windows 8.1 and Windows 10. This means that you can install Flash Player 21 for Google Chrome and Firefox while Internet Explorer and Microsoft Edge browsers will get the Flash update through Windows Update only. From this release, Adobe has started collecting anonymous usage data from the users who are using beta version of their Flash Player and Air platforms. When you install the new Flash Player 21 beta, you will get a check box option for “Usage Data”, allowing users the choice to opt in or out of anonymous data collection feature. You can also opt out of this services after you have installed Flash Player. Just go to Control Panel –> Flash Player (32-bit) and uncheck the option for “Usage Data”. If you are a mobile user, you will be able to auto play media in your iPhone or Android phones. But for this, the developer must have auto play feature configured in the code (inside StageWebView). Another enhancement in Flash Player 21 is the browser zoom factor feature. Now the Flash content will also zoom if you zoom a web page in your browser. If you are using a PPAPI supported browser in your MAC (like Google Chrome), Flash Player 21 comes with better support for vector printing. Previously, this feature was only available for NPAPI based browsers including Firefox. 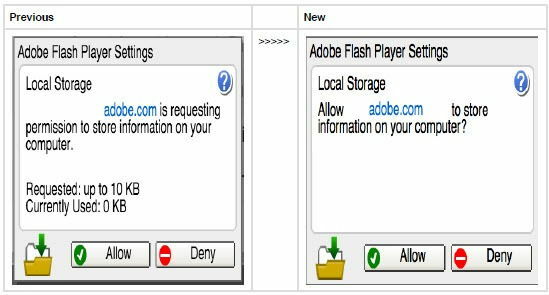 For detailed features and enhancements, see Flash Player 21 release notes.